ASSANGE IS A HERO! THE TRUTH SHALL SET YOU FREE!! The recent arrest of WikiLeaks cofounder Julian Assange in London is an outrage. There are so many things wrong with this situation that I could write a book. A long book. Assange had been granted asylum by the Ecuadorian government back in 2012, and became a citizen of Ecuador in 2017. Now, they have revoked that asylum, invited the London Police into their embassy to arrest him, and he is sitting in jail cell presumably awaiting extradition. Many international human rights groups believe that he should be released. This is a cautionary tale about governments and government agencies. The behavior of Ecuador’s president, Lenin Moreno, is reprehensible. It is proof that all too often a government can say something or promise anything one day, and change its mind on a different day. That becomes very true when there is a change of leadership in a government. It is known that Moreno has been implicated in a corruption scandal in Ecuador by his country’s legislature. As always, governments show they cannot be trusted. Assange may appeal to the government of France for asylum on humanitarian grounds (he has a son who lives in France). But what would come next? Does anyone really want to trust the French to do the right thing? Assange will always be on the run unless the United States drops its legal case against him. The international media should be praising the work that Assange and WikiLeaks have done over the years. Assange should be as revered as Daniel Ellsberg, who released the Pentagon Papers in 1971. Our United States Constitution guarantees freedom of the press. 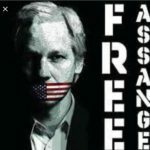 Assange should be treated as a reporter and WikiLeaks considered a news reporting organization. It should be stated that Assange is not accused by the United States government of hacking. He is a reporter who has used a hacker as a source. He is a journalist who has sought to protect his sources, which earned the enmity of several national governments. If we value freedom of speech then we have to stand in support of him. If we care about holding our own government accountable, especially when it is engaging in unjust warfare overseas, then we need people like Assange doing the very work that they have done. The justifications for our military misadventures have often been spurious. We need to admit that the United States either has no clue about what it is doing in the Middle East, or (worse) is an intentional bad actor. Ellsberg, Assange and others have done the necessary work over time to expose our foreign policy misconduct. It’s time to free Julian Assange!